The entrance to any building or home presents itself in the form of a door which we knock or ring the bell, hanging nearby, to get and entry through it. This is the first things first, sort of element, that catches our attention and therefore, a lot of people decorate their doors with fine decorative pieces to create an inviting look for the entrants. At times, doors are especially decorated for occasions such as Christmas or birthday parties to produce an exact theme on the gateways so that guests are welcomed in a stylish manner. This is why; people look out for door decorating ideas to give their entrance spots a charming display. Well, these ideas center around decorative items such as flowers, festoons, stars, ornamental embellishments, engravings etc. from which you can choose and give your door an adorned look. If nothing suits you fine and you want a simple and sober display, paints also provide a good option to decorate the doors. It is just about bringing in the right look for the right occasion. Below, we have shortlisted 25 door decorating ideas that will give you cool information on the subject. Take a look. If you liked our selection, perhaps these other posts will interest you too, Mountain Home Designs, Moroccan Interior Design, Minimalist Interior Design and Rustic Interior Design. Christmas theme decoration, done on the white doors with flowers and festoons, looks more enchanting with the snow-capped trees around the home. Large front door colored with royal purple shade that looks very vibrant and appealing with the flower bouquet decoration. Flowers and smileys, create a sweet and adorable look on the glass door that has a beautiful flower-pot and door mat, placed below. White door having green leafy garlands with red balls, hung on the sides, looks adorable and produces a pretty ambience at the entrance. The sparkling red stars and their miniature white cousins, pasted on the light yellow, wooden door create a lovely Christmas mood. Designer engraving along the borders of the door, creates a textured look that is very regal and majestic in appearance. Welcome the guests on the big day with a huge green Christmas tree that has small led bulbs lit around it for a festive look. Red and silver foil paper wrapped on the door and having paper cuttings pasted over it along with led lights around that create a charming look. This is a lovely idea that creates a garden like, colorful look on the door with the help of butterfly cutouts. Dark door having golden embellishments over it and artistic creativity around, on the borders, makes for a splendid portrait. Flowers and colorful paper festoons produce a pretty look for the wide and strong Church door having engraved design. The leaves spread all over the door with a bunch of light yellow flowers hung on top, looks very soulful and decent. A cheerful welcome idea given shape on the door with a big smiley hanging, that is simple but very charming in outlook. Butterflies, flowers and fruits along with leaves, hung on the door as decorative items, looks very cute. A badass and awe-inspiring look created on the brown door with big bolts and lion portrait that also possesses a retro, old world touch. Pleasing light and dark color scheme, created with red paper on the white door, having a cool cutout design that looks very vibrant. This is the entrance to a Buddhist temple that displays a colorful and delectable embroidery on the sides along with a canopy like structure for an aesthetic look. White Church door having an elaborate, artful design, with curvy and geometric architecture that oozes a serene and soothing ambience. This door has got multiple decorative pieces, pasted on a bright red base that includes beads festoons, leaves and small pictures. The foo dog i.e. the Chinese guardian lion has been referred to as the protector of Buddha in religious texts and most of the times, it is found on Buddhist temple gates. Painting the doors with lovely colors like pink and blue can bring out fetching look without much efforts and zero embellishments. Delightful door having bunny cutouts with faces of children and flowers all over the space brings out a lovely look for the classroom door. The white doors decorated with ornamental embellishments look very sophisticated and present a graceful portrait. 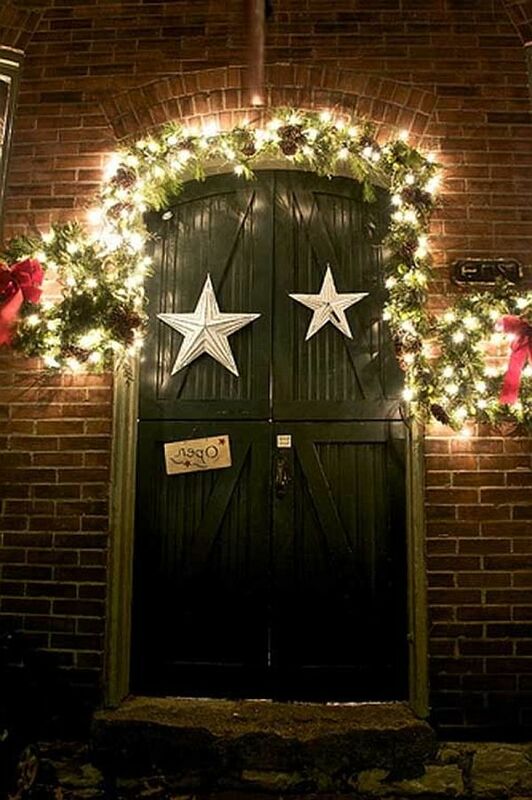 Another Christmas theme door decoration that has two big and bright stars along with shining floral festoon, having light bulbs glowing inside.